A great atmosphere and quality food in the heart of Dublin is hard to beat. Tired of eating in fast food restaurants and want something nutritious that will tickle your taste buds? Elephant and Castle is one of the most popular restaurants located in the heart of temple bar since the doors opened in January 1989. Famous for its American style burgers and hot chicken wings, where did the idea for this restaurant develop from? In New York, a man George began to get fed up of not being able to eat what he desired on his lunch breaks. After retiring from his job, he followed his passion for quality food and Elephant and Castle became a New York classic within a number of years. The restaurant made its way to Dublin when the head chef in New York came home to Ireland, as was denied her visa to travel back to America. After this happened, George decided to come to Ireland and find a location as similar to the one in New York as possible. He wanted to recreate the famous New York restaurant, knowing it would be a hit in Dublin. 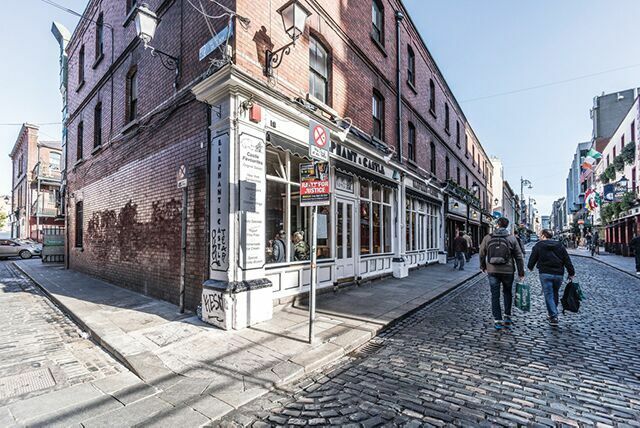 Temple bar was the ideal location, the business began to take off and has been booming ever since. The wooden décor, from the floors to the furniture and walls makes this restaurant different to others in Temple Bar. The closeness of tables creates a friendly and relaxed atmosphere, perfect for a chilled date night or a catch up with family and friends. The staff are always polite and very helpful in making the experience in the restaurant even more enjoyable. It is always spotlessly clean, the food presentation is lovely and you are not left waiting long to be served. As its thirty-year milestone is approaching, Elephant and Castle are planning on expanding to meet the demands of the business. This will be an excellent move for the business and will give more customers the chance to try the top quality food. Elephant and Castle is open seven days a week. They cater for breakfast, brunch, lunch and dinner. They are open between 8:00 am-11: 30 am for breakfast Monday to Friday. Brunch is only available during the weekend between 10:30-4:30 pm. Opening hours for lunch and dinner are 11:30 am – 11:30 pm Monday to Friday and 4:30-11:30 pm Saturday and Sunday. Although there are many amazing options on all of the menus, the most popular dish is the “Spicy chicken wings in a basket” for €13.50. If you are a lover of hot sauce these are the wings for you! The best thing about these wings in comparison to others is the quantity, combined with the secret ingredients which make the sauce so desirable. They are great as a main course or for sharing as a starter. In Lovin Dublin’s “chicken wing bucket list 2018” Elephant and castle is said to have been voted the best chicken wings in 2017. Although the wings are one of the main attractions, for those who do not enjoy spicy food there are plenty of other options to choose from. The lunch and dinner menu has a wide variety to choose from and has something to suit all taste buds. For something light to start, the small three leaf house salad or the baby Caesar salad both with grilled chicken are recommended. The menu options consist of soups, main course salads and warm dishes from grilled chicken with lime and coriander to fillet steak with peppercorn sauce, potato gratin and garlic greens. They offer omelettes, homemade burgers, Elephant and Castle sandwiches and five tasty side dishes including herb fries with sage and rosemary and garlic greens with lemon zest. For those of you with a sweet tooth, there is a large variety of desserts ranging between €6.50-€8. While you are waiting for your meal you can enjoy cold and hot drinks, a glass of wine or a bottle of beer from the large drinks menu. If you decide to visit the restaurant over the weekend it would be advised to pop in and book your table early as bookings fill up fast and there is not an option to phone ahead of time unless you are booking for a group of 6 people or more. If you find yourself with free time whilst waiting on your table why not visit some of Temple Bar’s other attractions for a drink, relax and enjoy some Irish music and culture. The restaurant is a great tourist attraction as it is a seven-minute walk from Grafton Street and O’Connell Street. It is an ideal point to meet for a bite to eat while exploring the city or taking a break from your Christmas shopping over the next few weeks. If you would like to find out more information before visiting the restaurant or to have a look at the menus yourself visit elephantandcastle.ie.